The Afghan Coat of arms or national emblem has been changed many times since they gained freedom from British. 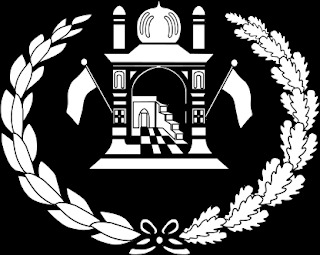 The current Afghan emblem consist of Shahadah written on top, below Shahadah Arabic words Allah-o-Akbar (Allah is greatest) are written, then below it there is a Masjid along with Minbar in it and Mehrab on both sides. 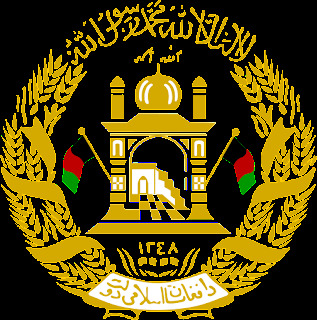 a flag is attached with each mehrab said to be national flag of Afghanistan. the Islamic Hijri yaer 1298 (1919 in Georgian) has been written below the masjid the year in which Afghanistan gained it's freedom from British influence. 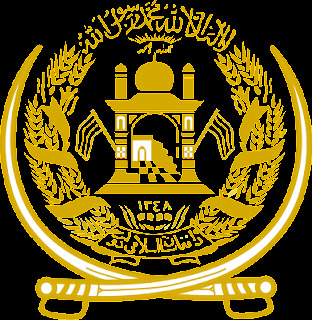 The Shahdah has written in semi-circle form and the rest of the circle has completed by two sheaves of Wheat. 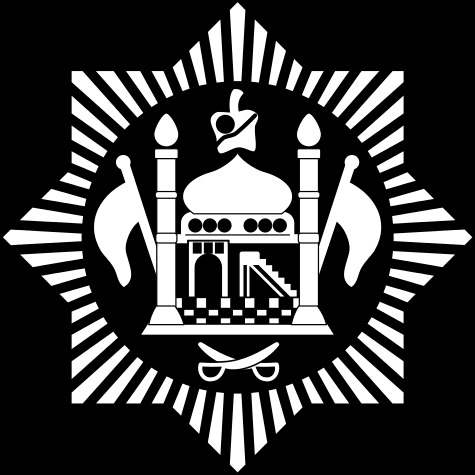 The masjid has been enclosed in this circle. on the bottom most part of the emblem of Afghanistan the name of the country has written. 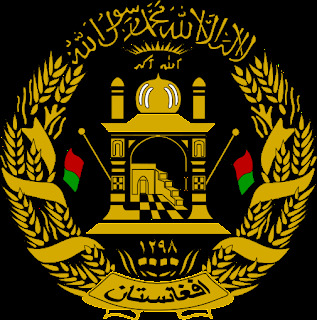 the original color of Afghanistan coat of arms is golden but it appeared in white color on the flag of Afghanistan which also has faced variations 20 times since 1919 and supposed to be the flag which has most changes in 20th century. 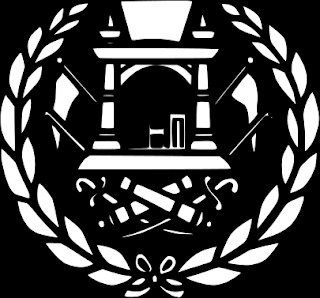 the interesting facts and history of Afghanistan flag and all the other country flags can be read there. here is the picture of Afghanistan coat of arms. 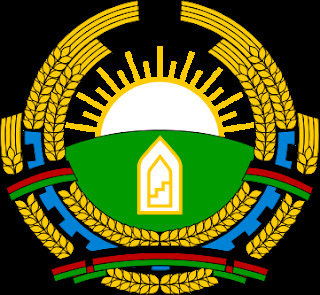 The first ever Coat of arms of Afghanistan it was during the era of Habibullah khan. 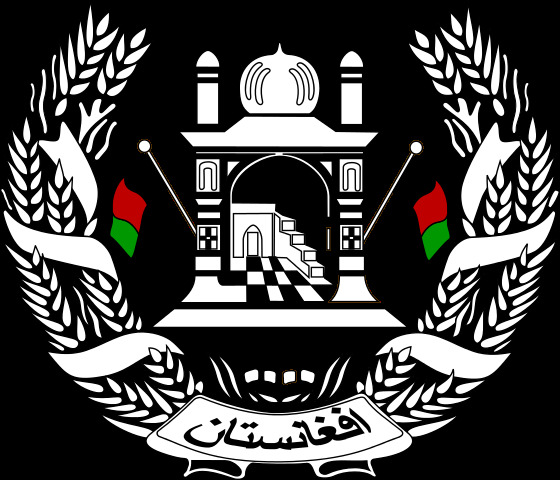 this coat of arm is said to be the initial design of the current emblem used in Afghanistan flag. 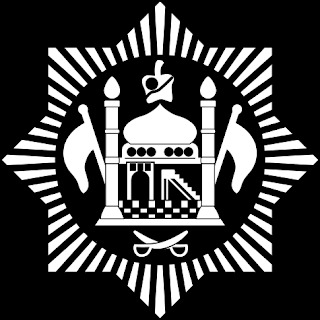 The octagram style was introduced in this coat of arms it was adopted from ottoman empire style of emblem. 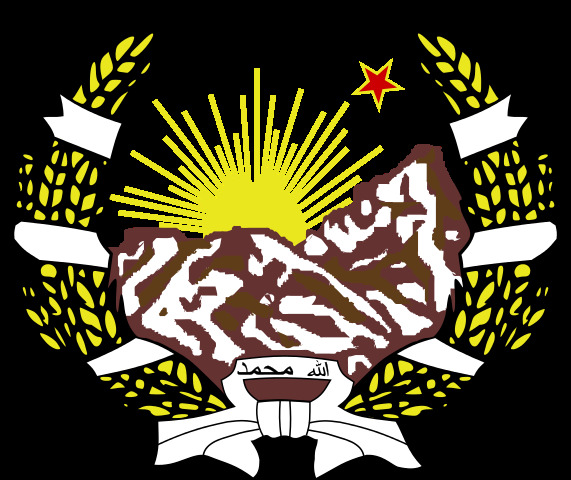 this emblem was proposed during the era of king Amanullah. second coat of arms under King Amanullah the wreath replaces the octagram. 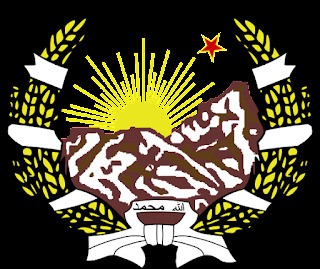 this Afghanistan coat of arms shows the rising sun from the peaks of the Himalayas to show the hope and the rise of new Afghanistan. 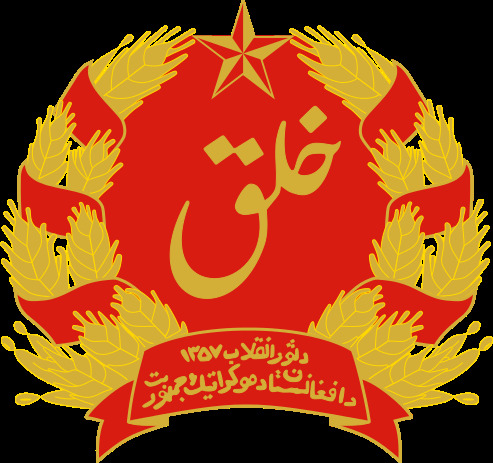 this coat of arms was used under the era of Nadir shah. sun and mountain had been replaced again with the masjid and the mehrab. major change was made in coat of arms during this era. 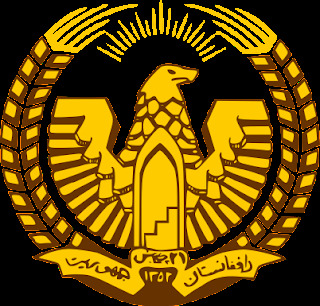 this coat of arms consist of an eagle with his wings widely spread and having pulpit on its chest, surrounded by wheat and the rays of the sun above. 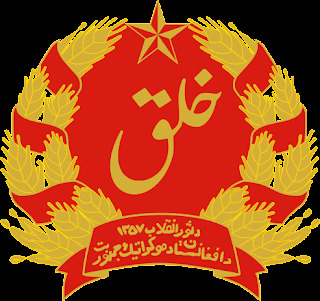 this emblem was used during socialist rule, an addition of star at top was made (representing the five ethnic groups of the nation) and eagle has been replaced with the word ‘Khalq’ (in Arabic) written in the center. this emblem was designed with a rising sun along with a pulpit and a book (said to be Communist Manifesto), ribbons with national colors, a cogwheel for industry, and a red star for communism. 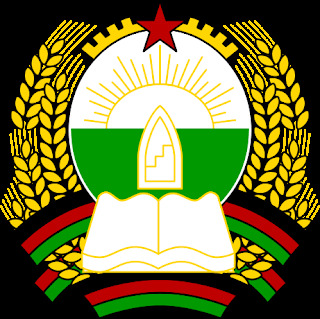 in this cog-wheel had been moved from top to bottom, red communist star and manifesto book were removed, and green field has been curved to resemble the horizon. 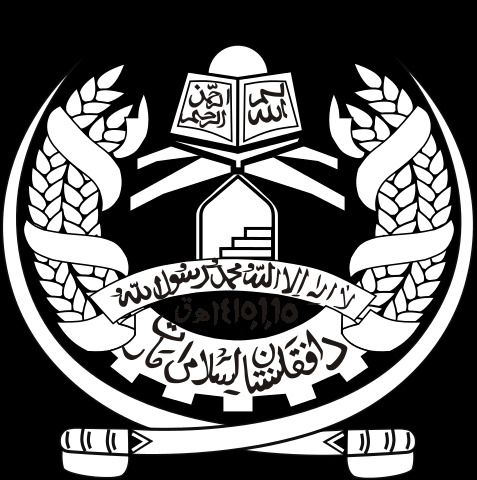 this Afghan emblem was used under Burhan-ud-din-Rabbani.Shahadah is written with in the logo. and on the bottom part of the logo was written “دا افغانستان اسلامی دولت”, Islamic State of Afghanistan. 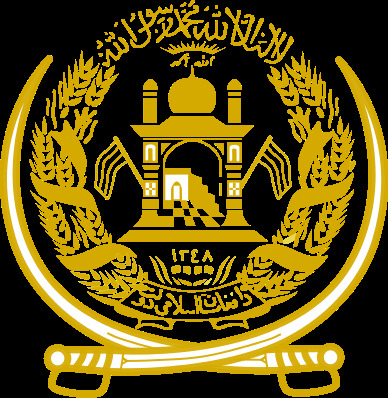 this emblem is the classical emblem of Afghanistan with a masjid with its mihrab and the minbar facing Makkah.